SOUTHAMPTON, N.Y. — Twenty-three year-old Scott Gregory shot 22 over par — dead last in the opening round of the U.S. Open — and then cheerfully answered every question from a group of reporters wanting to know what went wrong. Gregory finished the day five strokes behind the second-to-last golfer, Michael Hebert. The 92 was the highest score at the U.S. Open since Felix Casas shot 92 at Bethpage Black in 2002 but short of J.D. Tucker's 107 at the Myopia Hunt Club in 1898. "It's been a long time," he said. "It's not the week I wanted to revisit it." "It's just great to be able to compete out here against these guys," he said. "Just walking the same fairways as Rory and Jordan Spieth and Tiger is pretty cool. I'm just trying to enjoy the experience." About 30 people — TV crews, volunteers and even Tiger Woods — spent several minutes helping Johnson look for the ball. Beem, who is working for Sky Sports, eventually stepped on it. 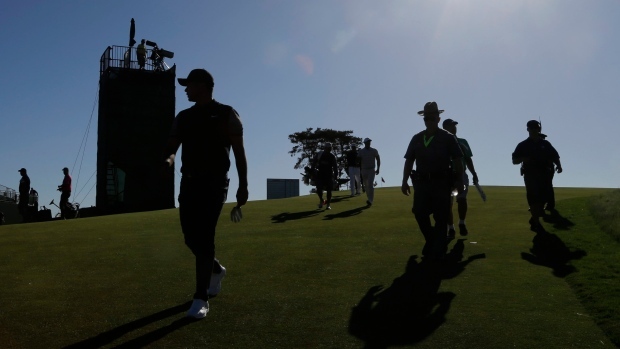 There was an accident that brought the roads just west of the course to a halt early in the afternoon — too late to affect the players but a problem for late-arriving fans. The USGA said both lanes were blocked and advised media to skip the 2 p.m. shuttle.